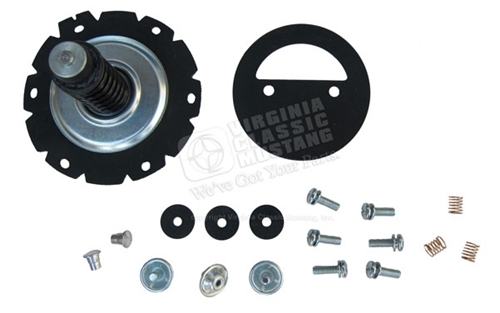 This Carter Fuel Pump Rebuild Kit fits 1967 and up Mustangs (and other Fords) with the screwed together fuel pump body - 428 CJ and 428 SCJ (ID # 4441), Boss 302 (ID # 4910), 429 CJ (ID # 4907), Boss 429 and 429 SCJ (ID # 4842). Also fits Carter aftermarket pumps with the same application. Diaphragm is 4 1/16" diameter with 3 5/8" diameter screw circle.